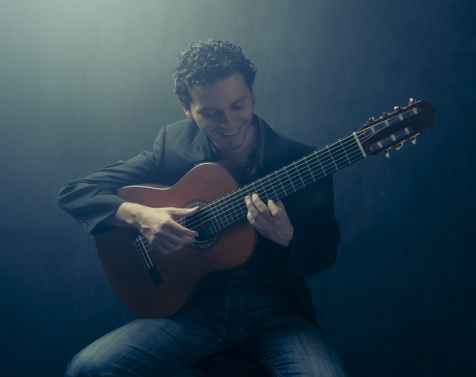 Cesar plays many other styles such as Samba, Bossa Nova, Waltz, American Jazz, Portuguese Fado and more. He currently hosts a Roda with Regional de New York at Beco Bar in Williamsburg every other Sunday of the month. The "Regional de NY" (Regional (choro band) of New York) is a traditional choro band. Choro is the first genuine Brazilian music. It is the predecessor of samba and bossa nova. The band is formed by very talented young musicians: Hadar Noiberg, flute / Vitor Gonçalves, accordion/ Ranjan Ramchandani, pandeiro / Kahil Nayton, cavaquinho / 7 string guitar, Cesar Garabini. "Regional de NY" hosts a bi-monthly "roda de choro" (circle of choro) jam session at Beco bar, Williamsburg. Visit choronyc.com for more info.